The best outdoor bar stools can be the ultimate statement piece. Bar stools have become such an iconic piece of furniture that in recent years, if you have somehow missed their transcendence into our everyday lives, I can only assume you have been somewhere away with the fairies in La La land. They can be found nowadays adorning our homes in the form of kitchen bar stools or if you look in any number of coffee shops, cafes or patisseries, you will find a liberal scattering of counter stools. Perhaps the biggest upheaval of our seating preferences are visible in our backyards where outdoor bar stools seem to be slowly but surely taking over. Maybe it’s a phase; maybe our current inclination to have outdoor bars and outdoor stations is all one massive fad. Or maybe this is the future of outdoor entertaining and getting on board right here, right now is the best thing that you could possibly do. Gone will be the days of slouching in a deck chair, barely able to get out of it at the end of the night because of excess food and drink. With your newly acquired outdoor bar stool, your posture stays good, getting on and off is a breeze and with the help of swivel stools, 360-degree viewing is now as easy as pie. There are, of course, numerous styles of stool that you will need to take into consideration before purchasing and these styles each have their own tailored use. For example, your traditional bar stool will be made from dark woods. These are the stools that you would most associate with being in a bar. They are more often than not fixed stools but you can purchase them with swivel seats. Due to the fact they comprise of wood, unless you afforded them the right protection, they would not be the most suitable stools for outdoor use. Stools that are made from rattan or wicker, however, are deemed to be perfect pieces of furniture for your outdoor shindigs. Also known as tropical stools, these items can easily take on all that Mother Nature wishes to throw at them. Rattan furniture has been with us for quite a while now and the benefits are there for all to see; easy to maintain, highly durable and weather resistant. It did take a while for the stools to catch the public interest. But now it has there seems no slowing down of its popularity. Where the biggest boom in best outdoor bar stools can be seen is in the more contemporary models. These are stools that tend to have a stainless steel or chrome framework and look the more current, cleaner and fashionable of all the stools. They generally have very low backrests or no backrest at all. Therefore you don’t often see armrests on the more contemporary pieces. The last most common type of stool I would like to talk about is the retro stool. These are also not that suitable for the outdoor setting, mainly due to their leather or vinyl composition. These materials really don’t like the sunlight and have the tendency to fade and crack under prolonged periods of exposure. What cannot be taken away from these stools though is their stunning aesthetics. They are without doubt the most beautiful stools to look at. And if you could afford yourself a little time and effort in regards to moving the stools into a garage or shed when not in use then you would certainly have pieces of furniture that guests will be purring over for weeks and months to come. Best Office offer this adjustable swivel chair that is a set of 2 and is made from synthetic leather. It basically looks the bomb and offers you all kinds of versatility. These seats come with a chrome base which has a pneumatically adjustable height function. This will take you from 21 – 30 inches and will turn you through a full 360 degrees. Just to top things off, these are bar stools with backs. So relax, if you so desire, by having a little lean back. 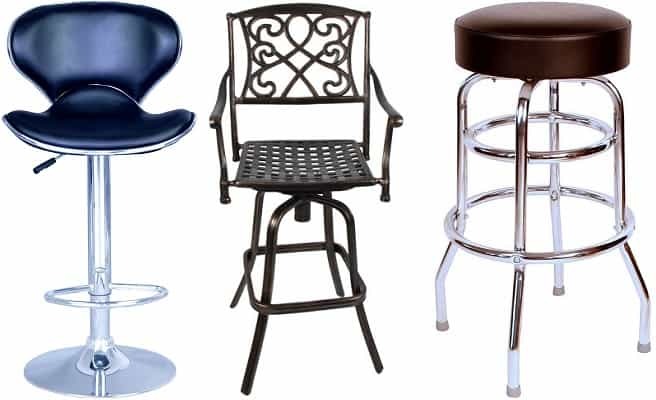 Budget Bar Stools have this relatively cheap bar stool that offers a lot of bang for your buck. It has the look of the more traditional bar stool. But lends itself to being a good outdoor option due to its metalwork frame. It is about as sturdy as can be with reports of 300lb + guys having no issues with them. And with the seat measuring 30 inches from the ground at its highest point, it offers a great vantage point for your shindig. 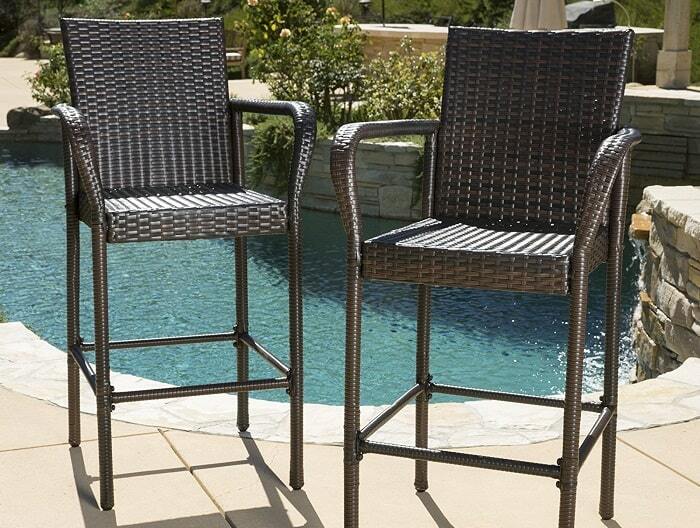 This set of 2 Stewart outdoor wicker barstool from Great Deal Furniture is probably the most suited for your outdoor needs. Because it’s made from tightly woven PE wicker it is able to withstand even the harshest weather conditions. What makes this a good stool apart from that though is its look. It is an elegantly simple design which incorporates a backrest and armrests. And with the seat at 30 inches, you are sure to have one of the best views in the house. Best Choice Products have given us the option of this cast aluminum, copper finished swivel bar stool. It is very heavy duty and will take on most upper weight limits. The classical antique style of the durable, rust-resistent frame adds a touch of sophistication to your outdoor décor. The stool is not height adjustable but the seat does sit at a very pleasant 29 inches. This is probably the most ideal height for your outdoor needs. Flash Furniture come up with something a little different to previous suggestions. But still sits comfortably in this best outdoor bar stools list. I guess you would describe these set of four, 24 inch counter height stools as minimalist or industrial looking. Whatever way you describe them they are certainly striking. The option of so many different colors adds a touch of variety to them. Whilst the height makes them good for kids to sit on and the metal frame lends itself to being easy to clean.